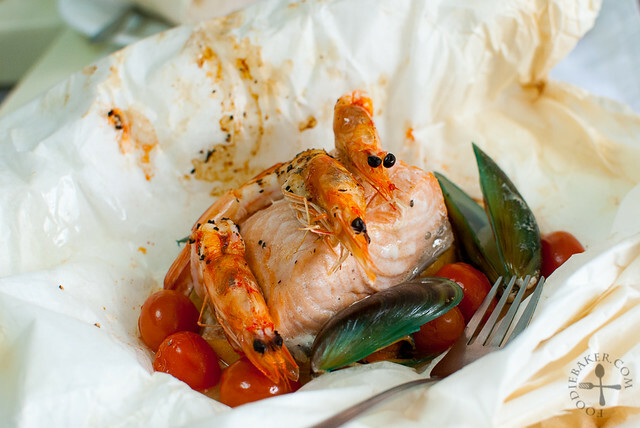 “En papillote”, which means “in parchment” in French, is a method of cooking, whereby food is placed in a pouch/parcel and then baked. 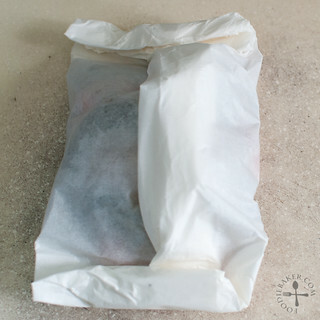 The pouch/parcel is usually made from parchment paper, which seals the moisture inside. While baking, the moisture becomes steam which helps to steam the food to perfection. 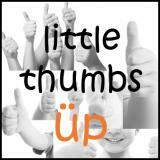 I actually made this dish for the previous Little Thumbs Up, in which the theme was Lemons, but I didn’t manage to blog it in time… luckily this month’s theme is Prawns! 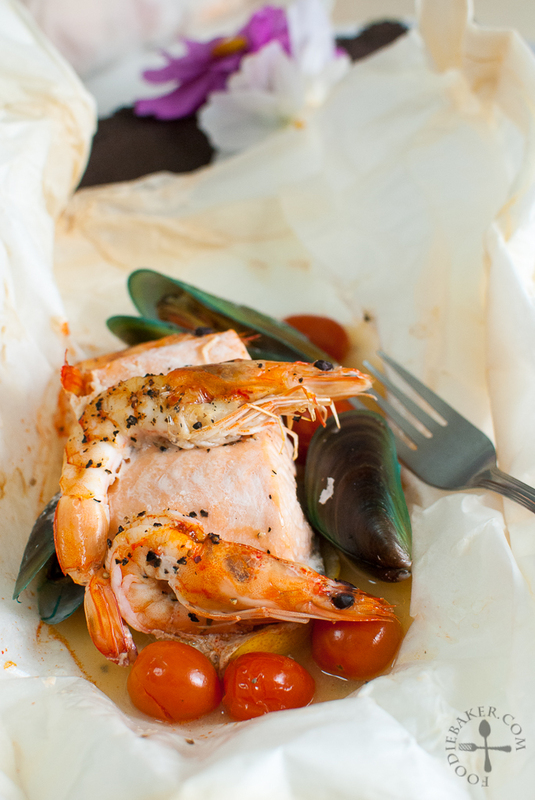 Seafood en Papillote is an extremely quick and easy dish to prepare – 5 minutes to wrap the seafood, 10 minutes in the oven, and it’s done! It’s also a really healthy dish because no oil is used! There is also a bit of seafood juice rendered after baking, perfect for dipping some slices French bread in! I only have 2 step-by-step photos – it’s that easy! 1) Grab the ingredients. 2) Wrap and bake! 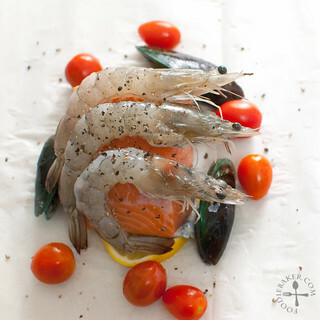 Making a parcel per person, lay a large piece of parchment and place the salmon fillet, prawns, mussels, clams, other seafood and cherry tomatoes and lemon slices in the middle. Season with salt and freshly ground black pepper. 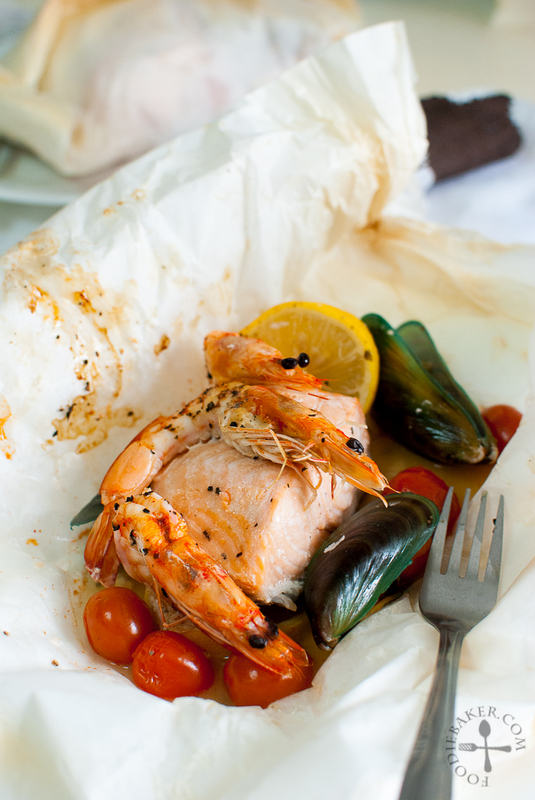 Fold the parchment and wrap it tightly, ensuring it is tightly sealed to prevent the steam from escaping. Place the parcels on a baking tray and bake for 10 minutes, until the parcel is slightly puffed up. Add 1 minute of baking per additional parcel (i.e. if there are 2 parcels, bake for 11 minutes). Transfer the parcel onto serving plates and serve immediately, opening the parcels in front of your guests! Ta papillote me met en appétit de bon matin ! I am at a lost at what to cook for this month’s theme….your dish looks so lovely but I have no salmon or clams! Let’s see if I can find other seafood to substitute!